Michael Fernandes is partner and co-head of Asia at LeapFrog Investments, a specialist investor in emerging markets, seeking the growth opportunity presented by 2 billion emerging consumers in Africa and Asia. 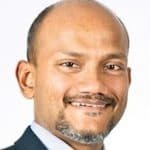 With more than 20 years of experience in health care operations, consulting and investing, he has led several of LeapFrog’s landmark investments, including an investment into Reliance Capital Management in Indonesia, a diversified financial services group and one of Indonesia’s largest insurers. With mobile technology rallying across the emerging markets, the tools to turn the tide on financial inclusion are finally within reach. However, low-income consumers won't truly adopt the digital movement until they believe they can benefit from it. Michael Fernandes of LeapFrog Investments says educating 2 billion emerging consumers may sound like a daunting task, but it can be done.